Posted June 21, 2011 by David Lewis & filed under Previews. Something strange is happening at the BFI Southbank. A young man is running around in a long blue army coat, looking flustered – but he’s more in need of a cleaning agent than a Time Agent. Meanwhile, a queue of hopeful-looking people are standing at the box office, waiting for any surplus tickets to be released for a certain event in NFT1. Down in the theatre itself, CultBox is trying to work out who the brown suede shoes poking over our shoulder from the row of seats reserved for ‘Guests of the BBC and Panel’ belong to without looking round. All over the auditorium, there’s an air of breathless excitement building, making it feel less like a traditional press screening and more of a fan-club celebration. Troupes of Torchwood devotees pile in, filling the majority of the seats, before a few familiar faces – Kai Owen, Tom Price, Julie Gardner – sneak in to a chorus of whispers. Then, with no pretence of subtly, a man with a huge grin and a mojito enters, whooping with excitement, and the audience erupts into applause. It’s John Barrowman, of course (looking younger than ever), followed by Eve Myles (looking more beautiful than ever), Russell T Davies (looking more tanned than ever) and the best president the United States of America never had, Bill Pullman. They sit down, hugs and handshakes are exchanged, and after a brief preamble from the BFI man about embargos, recordings and spoilers, the lights are dimmed and the first episode of Miracle Day bursts out of the screen. An hour of explosive action, tantalising set-ups, jokes about overweight babies and enough Americans saying ‘Torchwood’ to make the word sound like some kind of born-again Buddhist mantra later, the lights come on, we study our scrawled-in-the-dark notes in the vain hope of being able to read them later, and John Barrowman, Eve Myles, Russell T Davies and Bill Pullman amble up to the stage to discuss the new series and answer questions. Barrowman is clearly very fond of Jack Harkness, who has come to delineate his career over the past six years, and he’s fiercely protective of the character – not to mention the series and the fans as well. 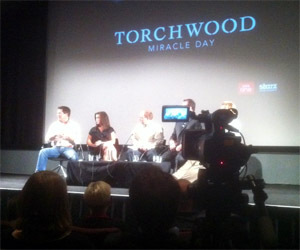 ‘We never thought of taking it away from you,’ he says in response to a question about any perceived Americanisation of Torchwood, and promises that the show’s roots will remain in the country in which it originated: ‘Welsh is its DNA.’ He also speaks very proudly of how the BBC is well-known in the United States whereas other UK networks are not. Bill Pullman listens to all the camp banter going on around him with slightly bemused but indulgent amusement. He’d never heard of Torchwood before – ‘I don’t watch TV’ – but the quality of the first three scripts convinced him to sign up. ‘This is a great piece with so much appetite,’ he says. A few questions from the floor conclude the panel session, with the penultimate query about braces from a breathless-to-the-point-of-swooning Barrowfan leading to a revelation that Captain Jack’s suspenders are looped under the epaulettes of his shirt. ‘We should have finished on that one,’ Russell Davies mutters as the final question turns out to be something rather tedious about the Face of Boe. Then there’s a final round of applause and the celebs depart, the rest of the room emptying out into the wet Waterloo evening. Most of the audience are very excited about the new series of Torchwood; one is thrilled about the prospect of seeing more of John Barrowman in braces; and CultBox is very relieved that our notes were so illegible, because the person in the suede shoes behind us was the director of Episode 1, Bharat Nalluri. Phew.